When Greg Simson first extended a firm invitation to Mark and I to present training at this weekend I asked myself what we would have to offer such an independent and capable paddling community. After Greg's reassurance that many members of the Tasmanian Sea Canoe Club were curious about different approaches to boat design, boat control and rolling, we put together a list of half day sessions based on generic principles such as ''torso rotation for power and injury prevention'' and ''edge control for manoeuvering and support''. Our main aim was to invite paddlers with a wide range of skills and experience to test the techniques we have enjoyed learning ourselves. We also wanted to show how much fun you can have paddling your boat with the rudder up or rudder off. As always we had the not-so -hidden agenda of promoting skeg boat paddling as a real and rewarding alternative...the way it is viewed in UK, Europe and North America. 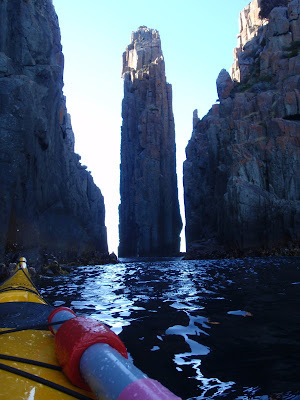 I thought we were a bit cheeky considering that some Tasmanian Sea paddlers not only have a very strong claim to invention of the flip over rudder but often consider a boat without a rudder to be unseaworthy. As it happened we were let off pretty lightly for our 'heretical views' and treated very well. In reality, this group reflected a national trend towards increasing diversity in equipment with Greenland, Wing and Flat blades all used side by side in boats that ranged from hard-core British tide-race boats and skinny ocean racers to beautiful replicas of Aleut and Inuit craft. Watching paddlers adapt the techniques we were presenting to different paddles and boats was fascinating and fun. On the Monday morning I conducted a rolling workshop for some of the club's volunteer instructors and mentors. We looked at different skills-progressions and ways of supporting learners, and there was some interest in a number of the different warm up and pre rolling drills that I demonstrated.The club's senior paddlers had already decided to teach the sweep roll as the "club roll"and I thought this was a good choice that will allow a consistent approach so that future training can be shared with confidence. With this in mind we looked at variations to tailor for individual differences in flexibility, equipment and personal learning styles. As with all good rolling sessions it concluded with all concerned messing around with different techniques, swapping ideas and generally having fun getting extremely wet and cold . Fine food (including the best abalone I have ever tasted), great company and a real sense of community made this a weekend to remember. 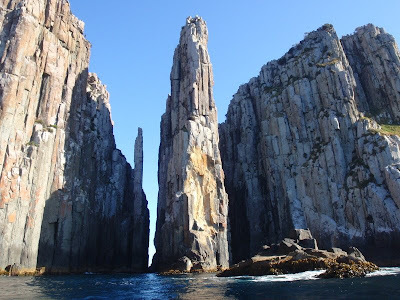 On Tuesday morning I had to decide whether to enjoy a leisurely drive from Fortesque Bay to Devonport or paddle out to the magnificent rock formations around Cape Huay and risk missing the ferry home. As you can see I made it out to the Cape and its many attractions and paddled through all the channels and gauntlets I could find. 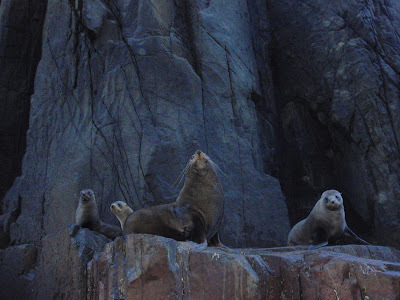 The fur seal family guarding the gap between The Candlestick and The Lanterns escorted me through the slow surge and out into the sun on the other side, but they became progressively annoyed with me when I kept paddling back and forward to admire the views. I arrived at the ferry terminal three minutes before they closed the ramp and as I caught my breath, I watched a lone paddler doing his afternoon workout around the Devonport dockside and I thought about the amazing contrasts we encounter as kayakers: whether it is training with a group of like minded individuals, a short blast around a familiar waterway, a detailed exploration of a rocky shore or a committed journey along a lonely coastline, paddling to the rhythm of the sea is good for the soul. 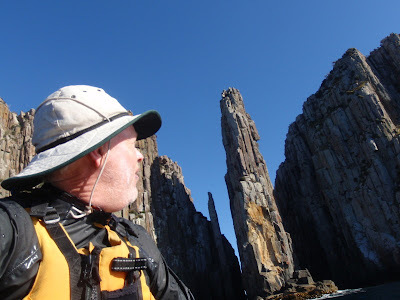 Thanks to Greg Simson for organising the weekend and the friendly people of the Tassie Sea Canoe Club for their open minds, companionship, hospitality, abalone and for sharing their ideas and paddling techniques with Mark and I.